Mangoes are indigenous to Indian subcontinent.A large variety of mangoes are abundantly available during summer some of them being Dashahari, Badam, Begampalli, Chousa ,Kesar and ofcourse Hapus (Alphonso) which largely gets exported and is quite expensive.It has an exquisite flavor which makes it very popular. Like the Chocolate I believe there would be very few who would not enjoy eating mangoes. It is the most extensively exploited fruit for food, juice, colour, flavor, fragrance etc. making it a common ingredient for functional foods & hence often called superfruit. I have got into my final purchase phase of Mangos as the season is going to end in a few days. I wanted to make a batch of Maavinkayi Chutney which I could use later. Fortunately/unfortunately when I grated the raw mango and tasted it I found it sweet. The chutney needs very sour mango and I was left with 1 Kg of grated sweet and lightly sour mango. I was stuck and was just not able to think, what I should do with them. But gladly my brain did help me in telling that I should call my mom. Mommy dear had an instant solution and told me to make Takku and Muramba. I was sitting pretty now that I knew what I had to with the mangoes and was hating myself for not having thought of it first!! Both the recipes I have been eating throughout my childhood as my mom made them every summer . Me and my father used to hog on the Takku and Muramba was used to eat with Roti or Paratha or with fruit custard. Muramba is quite like Jam, the only difference being that in Jam the fruit is cooked and mashed but in Muramba small cooked pieces are used. The Takku is normally eaten in a similar fashion as we eat pickle or chutney and can be eaten during fasts(Upvasa) . The Takku lasts for a month and should be refrigerated . Muramba lasts for a year or more if a good preservative is added. 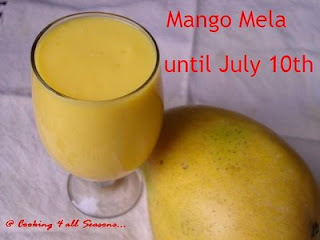 Both the recipes are my entries to Mango Mela at cooking4allseasons hosted by Srivalli. Mix all the ingredients and fill it in a jar and keep it in sun for 5-6 days. Let the mango imbibe the spices and release it's own juices. Mix it once or twice a day. After 5-6 days the Takku is ready. For those who can not keep the Takku in sun, pressure cook the raw mango for 10 mins without putting the weight. And then mix salt and chilli pwd. Pressure cook the raw mango with a little water till you get 2 whistles. Cool it for 3-4 hrs and then strain the water. Use this water to make sugar syrup. In a pan take the sugar and add the water enough to immerse the suagr. Boil the sugar solution till you get a three string consistency ( Goli band / Pakki chashani). Check it by putting a drop of it in a bowl of water, if the drop solidifies immediately the syrup's ready. Now add the steamed raw mango, citric acid and cook it in the sugar syrup till you get a honey like consistency. Cool and add crushed cardamom, saffron and 1/2 tsp of sodium benzoate (preservative). 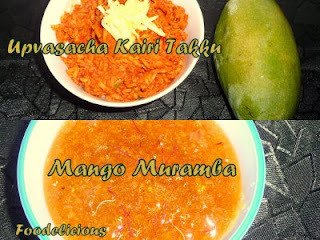 Hey Pari, both the dishes sounds too good, sad we dont get mangoes here anymore, would love to try these! Both dishes sound really good Pari. I wish I could buy sun ripened mangoes as you do!! 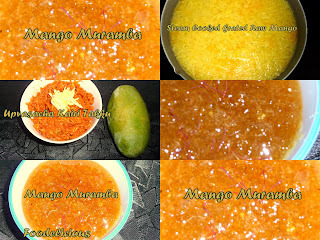 mango muramba sounds very interesting!